Although we have enjoyed a string of unseasonably warm days here in North Texas, it is still winter time. As we prepare for the mild cold front this weekend, it is a great time to stock up on those warm winter drinks. However, as you fill up your shopping cart, stop and think about how your favorite beverages can affect your healthy smile. Unfortunately, winter time drinks are often full of sugar and other substances that can cause dental damage. By making wise choices and consuming sugar in moderation, you can keep your smile bright and ready for spring. 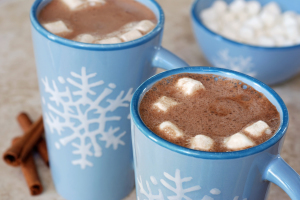 Hot chocolate, a favorite winter drink, is actually one of the worst winter beverages for your teeth. The drink is full of sugar, and if you top your cocoa with marshmallows, the sugar content is even greater. Sugar provides energy for oral bacteria. As microbes feed off of sugar, they will form acid. In turn, acid will eat into your dental structure, causing cavities. In lieu of hot chocolate, nosh on a piece of low-sugar dark chocolate. Pure cocoa contains products that fight will bacteria and strengthen your dental enamel. It’s no secret that coffee will stain your teeth, but it may have some dental benefits, as well. Researchers at Federal University in Rio de Janeiro found that coffee can break down bacterial biofilms, one of the primary causes of dental decay. Additionally, researchers at Boston University discovered that men who regularly drank coffee had a lower risk of developing gum disease. Of course, the beverage can still cause dental stains. Fortunately, we offer several forms of teeth whitening, including KöR® Deep BleachingTM. KöR® yields permanent results, even if you routinely drink stain-producing coffee or similar substances. While coffee can have benefits for your smile, tea may be the most advantageous winter drink of all. Black tea, like coffee, is notorious for causing dental stains. However, green tea will have little to no impact on the color of your smile. Additionally, all tea contains tons of antioxidants, which will strengthen your immune system and boost your ability to fight off oral bacteria. The beverage can also help prevent bad breath, thanks to its high concentration of polyphenols. Remember, with both coffee and tea, avoid adding sugar or honey. Sugar will negate the benefits for your healthy smile and increase your risk of dental decay.